The stunted and undernourished girls are more likely to have complications in future. Anemia is also associated with three times increased risk of premature delivery and higher incidence of low birth weight infants. Even though implementation of the Adolescent Girls Anemia Control Program for over a decade by the Government of India with an objective to reduce the prevalence and severity of anemia in school going adolescent girls using schools as the delivery channel, the problem still persists. The underlying sociodemographic factors and practices during menstrual period need to be studied in adolescent girls and a way to reduce anemia not only by supplementation of iron and folic acid tablets and deworming but ensuring its regular consumption. The present study was undertaken to highlight the effectiveness of deworming and iron and folic acid supplementation in reducing the prevalence and severity of anemia in adolescent school girls in Amravati. To study the effectiveness of iron supplementation in reducing anemia in adolescent school girls. The present interventional study was conducted at Sharada Kanya Vidyalaya, in Amravati city which was a before and after type of study design. The total numbers of girls studying in various classes of 7 th -12 th in that school were 1100. Out of this 350 adolescent girls were selected by random sampling technique after taking informed consent. The study period was from August 2013 to November 2013. By considering 56% of anemia prevalence in adolescent girls  at ±`5% allowable error, a minimum sample size calculated was 324. In this study 350 girls were included. After obtaining the permission from Institutional Ethical Committee, the written permission was obtained from the Principal of the school and the parents of the students. A predesigned proforma was used to obtain the data regarding age, socioeconomic status, and details of menstruation and related practices. The anthropometric measurements such as height and weight were recorded using stadiometer with weighing scale with maximum accuracy. The body mass index (BMI) was classified according CDC guidelines (<5 th percentile as underweight, 5 th to <85 th percentile as normal, 85 th to <95 th percentile as overweight, and ≥95 th percentile as obese)  The percentile BMI of adolescent girl was calculated at 5 th , 85 th , and 95 th percentile and the values of BMI for these percentiles were 13.2, 19.9, and 23, respectively. The socioeconomic status classification suggested by B.G. Prasad was adopted. Hemoglobin estimation was done by obtaining 2 mL of venous blood by venipuncture and analyzed by colorimetric method. The diagnosis is established as anemia according to DLHS guidelines. According to DLHS survey, hemoglobin level between 10.0 and 11.9 g/dL is mild anemia, 8.0-9.9 g/dL is moderate anemia and below 8.0 g/dL is severe anemia. All the girls were given a supervised single dose anthelminthic (Tab albendazole 400 mg) and the girls who were anemic were given iron and folic acid tablets (ferrous fumarate 152 mg and folic acid 750 μg) for daily consumption at home after meals. All the girls were given advice on healthy dietary practices including hygienic care during menses. The regular consumption of iron folic acid tablets was assessed by periodic visits to the school and correcting faulty dietary practices. The consumption of iron tablets was ensured by collecting empty blister packs and then giving new tablets every fort night. After 3 months of completion of treatment, hemoglobin (Hb) was estimated by the same method for all anemic girls and randomly among 50 normal girls. The Chi-square test was used for statistical analysis of qualitative data and for quantitative data, standard error of difference between two means was applied using SPSS version 16.0. Overall prevalence of anemia in adolescent girl was 55%. 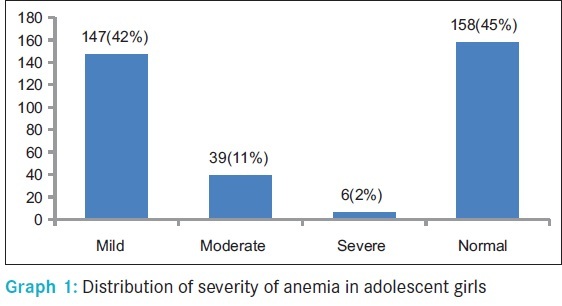 It was observed that out of 350 adolescent girls, 147 (42%) had mild, 39 (11%) had moderate, and 6 (2%) had severe anemia, and 158 (45%) were having normal Hb levels [Graph 1] [Additional file 1]. [Graph 2] [Additional file 2] shows that those families with members less than or equal to 4, the proportion of girls suffering from anemia was high (70.1%) as compared to the families with more than 4 members. The difference was found to be statistically significant (P < 0.05). [Table 1] shows that out of 57 adolescent girls belonging to classes IV and V, 85.9% were anemic, whereas out of 293 adolescent girls from classes I, II, and III, 48.8% were anemic. The difference was found to be statistically significant (P < 0.01). Out of 350 adolescent girls, 272 were purely vegetarians and among them 57.7% were anemic as compared to 44.8% who were anemic among nonvegetarian. The difference was found to be statistically significant (P < 0.05). The total number of underweight girls were 262 and four girls were overweight according to their body mass index. From 192 anemic girls 73.5% were underweight and 2% were overweight. The result was not statistically significant indicating that weight does not have much impact on anemia in this study (P > 0.05). Out of the total number of girls, only 133 (38%) had attained menarche. A higher prevalence of anemia was found in girls who attained menarche (74.4%) as compared to those who did not (42.9%). The difference was found statistically significant (P < 0.01). Out of a total of 350 girls, 192 were anemic and after deworming and iron and folic acid supplementation for 3 months, it had reduced to 89, that is, 55% to 25%. 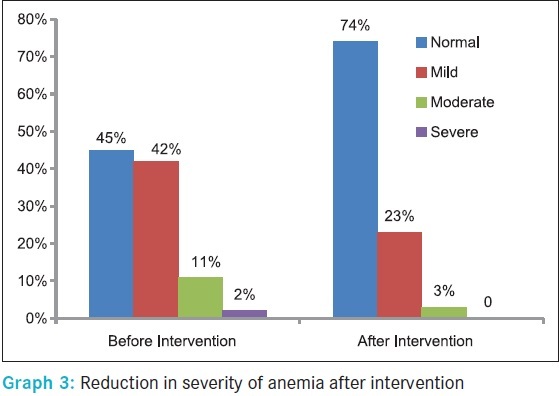 The proportions of girls having mild, moderate, and severe anemia were 42%, 11%, and 2% before intervention and 23% and 3% of the girls had mild and moderate anemia, respectively, after intervention. There was no girl with severe anemia after the intervention in our study [Graph 3] [Additional file 3] . Out of total 192 girls who received intervention, 82% of them consumed it regularly and 18% consumed it irregularly due to side effects such as metallic taste, nausea, and abdominal pain following its consumption. At the end of 3 months of intervention, five girls were lost to follow up, hence it could be possible to estimate hemoglobin level of 185 girls only. The reasons for lost to follow up were that three girls with severe anemia were referred to higher centers for further treatment and two girls were absent even after repeated visit. Mean and standard deviation of Hb% in adolescent girls significantly increased from 10.57 (±1.09) before to 11.78 (±0.99) after intervention [Table 2]. In the present study, 192 (54.8%) girls were having anemia and 158 (45.2%) were normal. This indicates that anemia is still a major public health problem. The proportion of mild, moderate, and severe anemia found in our study correlated with NFHS-3 data. Similar prevalence was reported by Kapoor et al. (60%), Singh et al. (50%), and Rana et al. (60%). A higher prevalence has been reported in various studies, namely,Bharati et al. (99.9%) and Chaturvedi et al. (73.7%). This may be due to the difference in the study area. A significant association was seen between girls being anemic and their socioeconomic status (P < 0.01). A higher proportion of girls were anemic in lower classes (IV and V) as compared to higher class (I, II, and III). These findings were similar to those studies conducted among adolescent girls by Rawat et al. and Chaturvedi et al. A higher proportion of girls from families with members four or less than four were anemic than those with family members more than four. When the dietary history of these girls was taken it was seen that these nuclear families were consuming more junk food, ready to eat food etc., in their busy life. The prevalence of anemia was higher in those who have attained menarche in our study. Rajaratnam et al. and Kaur et al. also documented a higher prevalence of anemia in girls who had attained menarche. Heath et al. found that a high menstrual blood loss was associated with increased risk of anemia. The additional nutritional requirements for growth and development during puberty and extra losses during menstruation might cause a higher prevalence of anemia in those who attained menarche. In our study, vegetarians were more anemic than nonvegetarians. Kaur et al. and Verma et al. also quoted that as compared to nonvegetarians, vegetarians were more anemic. In developing countries such as India, poor bioavailability of dietary iron coupled with low intake of haem iron derived from animal foods is a major etiological factor for anemia. The limitation of the study was that all girls with normal Hb level were not followed. Hence, in before and after comparison study design without a control group, the validity and reliability of findings regarding the effect of intervention is less. The present study revealed a comprehensive picture of sociodemographic factors and menstrual factors along with the effect of intervention in reducing prevalence and severity of anemia. 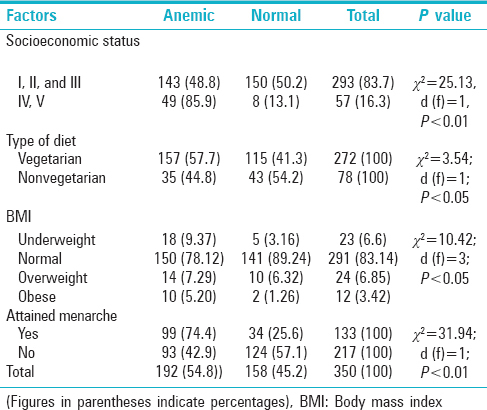 The contributing factors of anemia seen in this study are: Low socioeconomic status, onset of menarche, small family size, and vegetarian diet. The mean Hb increased by 1.21 gm% after iron supplementation. Even though various national programs exist in our country since decades, problems of anemia in adolescent girls still persists. A number of strategies are available for dietary modifications based either on promoting the intake of iron, absorption enhancers, including haem iron, or on reducing the ingestion of absorption inhibitors (such as phytates and tannins) to double the bioavailability of iron. There is a need for counseling parents to prevent their children from consuming junk foods, which is becoming a trend in nuclear families. A significant association of anemia with the low socioeconomic status suggested a need to develop strategies to improve the socioeconomic status of the population through poverty alleviation programs. This should be supported by programs for the prevention of anemia among adolescent girls through nutrition education and prophylaxis with iron and folic acid supplementation with deworming. Mathur JS. Preventive and Social Medicine, A Comprehensive Text Book. 1 st ed. New Delhi: CBS Publishers and Distributors; 2007. p. 382-9. United Nations International Children's Emergency Fund (UNICEF). Briefing Paper Series: Innovations, Lessons and Good Practices. The Adolescent Girls Anaemia Control Programme. Breaking the Inter-Generational Cycle of Undernutrition in India with a Focus on Adolescent Girls: United Nations: International Children's Emergency Fund (UNICEF); New Delhi; 2011. p. 1-4. Nutritional Status of Children and Prevalence of Anemia among Children, Adolescent Girls and Pregnant Women. District Level Household Survey on Reproductive and Child Health. Ministry of Health and Family Welfare, New Delhi: (Deemed University); 2006. p. 61. Gillespie S. Malnutrition in South Asia. A Regional Profile. Vol. 38. Kathmandu, Nepal: United Nation; 1977. p. 189. Nutritional anaemia. National Family Health Survey (NFHS-3) 2005-2006. Vol 1. Ministry of Healthy and Family Welfare, Government of India, New Delhi; 2007. p. 308-9. Baride JP, Kulakrni AP. Text Book of Community Medicine. 3 rd ed. Mumbai, India: Vora Medical Publications; 2006. p. 12-35. 8 McLean E, Egli I, Cogswell M, De Benoist B. Worldwide Prevalence of Anaemia 1993-2005: WHO Global Database on Anaemia. World Health Organization. Switzerland ;2008. p. 6. Kapoor G, Aneja S. Nutritional disorders in adolescent girls. Indian Pediatr 1992;29:969-73. Singh J, Singh JV, Srivastava AK, Suryakant. Health status of adolescent girls in slums of Lucknow. Indian J Community Med 2006;31:102-3. Rana T. Age at Menarche Nutritional Status and other Associated Factors in Urban Hyderabad Girls. Hyderabad: National Institute of Nutrition; 1983. p. 17. Bharati P, Shome S, Chakrabarty S, Bharati S, Pal M. Burden of anemia and its socioeconomic determinants among adolescent girls in India. Food Nutr Bull 2009;30:217-26. Chaturvedi S, Kapil U, Gnanasekaran N, Sachdev HP, Pandey RM, Bhanti T. Nutrient intake amongst adolescent girls belonging to poor socioeconomic group of rural area of Rajasthan. Indian Pediatr 1996;33:197-201. Rawat CM, Garg SK, Singh JV, Bhatnagar M, Chopra H, Bajpai SK. Socio-demographic correlates of anemia among adolescent girls in rural area of district Meerut. Indian J Community Med 2001;26:173-5. 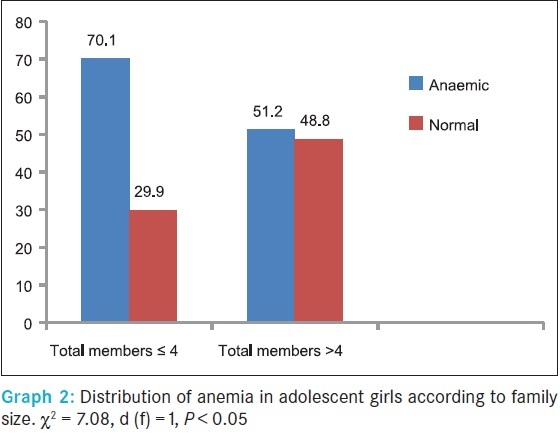 Rajaratnam J, Abel R, Asokan JS, Jonathan P. Prevalence of anemia among adolescent girls of rural Tamil Nadu. Indian Pediatr 2000;37:532-6. Kaur S, Deshmukh PR, Garg BS. Epidemiological correlates of nutritional anemia in adolescent girls of rural Wardha. Indian J of Community Med 2006;31:255-8. Heath AL, Skeaff CM, Williams S, Gibson RS. The role of blood loss and diet in the aetiology of mild iron deficiency in premenopausal adult New Zealand women. Public Health Nutr 2001;4:197-206. Verma M, Chhatwal J, Kaur G. Prevalence of anemia among urban school children of Punjab. Indian Pediatr 1998;35:1181-6.